When planning a party, don’t forget to glamorize your garden and landscape! Outdoor decorating can become an afterthought when there are so many other details to keep in mind. 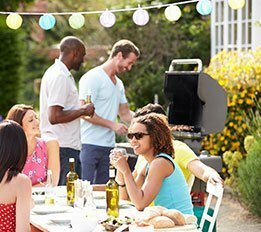 Setting the stage for a great summer party doesn’t actually have to be especially time-consuming if you think outside the box. In ten minutes, you can easily kick your party up a notch. Whether your guests spend much time outdoors or not, a well-executed outdoor living space elevates the atmosphere. Low containers filled with plants make excellent centerpieces. Small houseplants work wonders for a shady spot on your table. Succulents if you’re sitting poolside. Purchase several hanging baskets to dress up your outdoor living space and add vertical dimension. If your summer party has a theme, choose baskets with flowers in coordinating colors. No place to hang? No problem. A shepherds hook gives the space a touch of elegance. Line up three identical planters to create borders or transitions, or tier multiple sized containers in complimentary colors to add pop to a boring corner. Groupings of objects and plants add interest and make your space feel polished. Use tropical plants or grasses if you prefer a sleek, modern look. Plant Lavender, Coneflowers, and Hydrangeas for a cottage look. If you’re in a pinch, cut blooms for a charming table arrangement. Add a row of larger plants to block your guests’ comings and goings from view. Narrow shrubs and young trees are appropriate choices if privacy is a concern. Edge the trunks of these plants with rows of contrasting pavers for a finished look. If your yard could use a dash of character, plant a unique, mature tree that complements your home and garden. Palms and weeping trees are examples of greenery that command attention. Eye-catching pots or garden art perched on pavers can be used to define spaces. Illuminate paths for guests with soft ambient lighting. Lit borders create a dramatic atmosphere. Lanterns and twinkling light strands are attractive accessories. Citronella candles are as well, and they deflect bugs. With a fire pit, guests can gather and warm up on a cool night. Be resourceful and reuse garden items you already have. Clear vases are perfect for displaying flower arrangements, fruit, etc. Be creative! A wheelbarrow is a good size to hold ice and drinks. Flower pots, jars, and watering cans make distinctive garden party accessories.